Things are heating up, as expected! ICYMI: The Talk 'N Text Tropang Texters drew first blood in the PBA Commissioner's Cup Finals, defeating the Rain or Shine Elasto Painters to take Game 1, 99-92. Once again, TNT's vaunted offensive juggernaut was in full display with Ranidel "Ang Pambansang Siko" de Ocampo leading the charge with a team-high 24 points. ROS kept fighting though and avoided being blown out, but in the end it wasn't enough. However, the biggest highlight of the match came not in the form of a dagger three or a rim-rattling slamma-jamma. Rather, it was a bump from Talk 'N Text import Ivan Johnson, which sent Rain Or Shine Coach Yeng Guiao stumbling to the bench. The incident happened in the latter part of the third quarter while the Elasto Painters were trying to catch up to the Texters. The bump left Coach Yeng and the whole ROS bench fuming. They tried to confront the 6'7", 255-pound American reinforcement (who was given a technical foul as a result and a hefty P150,000 fine after the game) but the referees intervened before anything more violent happened. We're accustomed to Coach Yeng dishing the physical and verbal assault (remember his confrontation with former TNT import Richard Howell last year? ), but it looks like the tables have been turned here. Naisahan ka ba, coach? The temperamental ROS coach went on to blast Johnson after the game, saying the 31-year-old former Atlanta Hawk did it on purpose and lacks breeding. "I’m not surprised because that’s been his reputation. It’s probably a lack of breeding and lack of respect and one reason he’s out of the NBA; one reason he’s playing overseas, and not getting a good reputation because of exactly what he does." Ouch! The thing is, the Guiao-Johnson skirmish wasn't the only thing that spiced up the quality game. 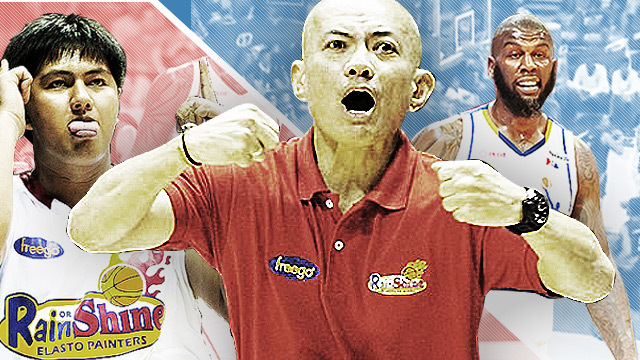 It's the finals after all and we predicted that emotions will run high (especially since ROS, which holds the unofficial title of the PBA's most bruising team, is involved). And it looks like we're spot on! Read on for three other "extracurricular" activities from Game 1! De Ocampo fell to the sidelines after a loose ball scramble with Beau Belga early in the third quarter. He had an unfortunate victim: PBA courtside reporter Apple David, who was the unwilling recipient of RDO's momentum. Okay, so this one's clearly unintentional. We mean, who would hurt a pretty gal like Apple on purpose, right? As expected, Beau Belga and Johnson had their own "moment." With less than four minutes remaining in the fourth quarter, Big Beau sent the Tropang Texters' hulking import flying out of bounds with a meaty elbow-forearm combo. And some are saying it's a freakin' flop! C'mon now, really? Eh kung kayo kaya brasuhin ni Belga?